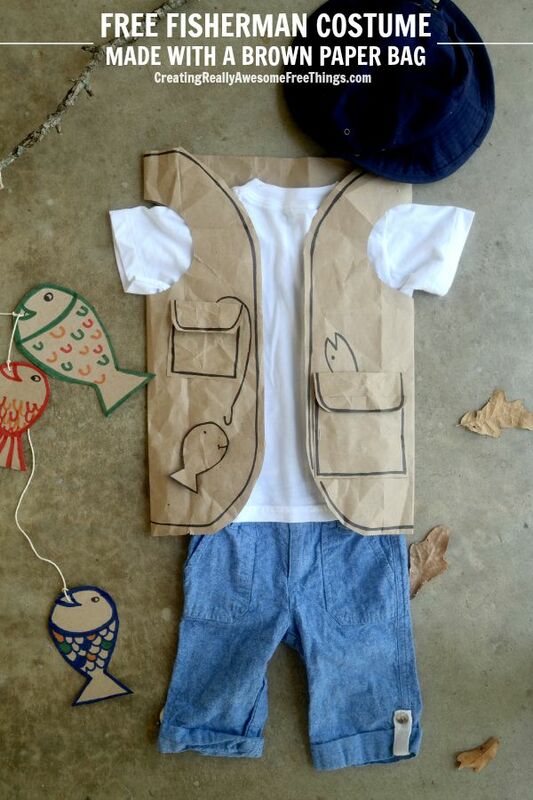 Easy Fisherman Costume - C.R.A.F.T. I love Halloween! And I’m not going to lie, I’m pretty excited that this Halloween I will have a legit belly! 2 years ago, I had a small belly, and made us this fun family halloween costume! Last year, I went way overboard, and made Maxwell, who was then 7 months 6 costumes, yep SIX! (cheeseburger, koala bear, panda bear, game boy, Bob Ross, and my personal favorite an organic carrot!) Just for the record, we didn’t even take the nugget trick or treating! Andy and I went to a Halloween party and Max stayed home with Grandma. What kind of horrible parents are we?! This year, I feel like he might get it more, and I want to let him attempt to trick or treat, but y’all I’m prego! And tired! He does not get 6 costumes. At least that is what I’m saying now, ha! I decided to whip him up a free costume made out of a brown paper bag! So stinkin’ easy and cute. Just for the record, brown bags are fragile, clear tape does wonders, but the paper bag vest might be better suited for an older toddler! 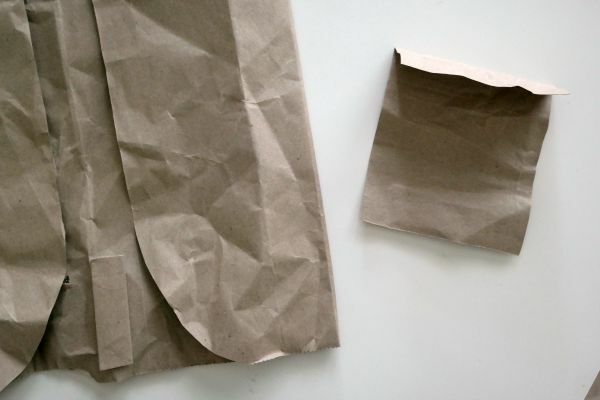 First, use scissors to cut a large brown paper bag flat so that it lays open. Then crumple it up! Kids are good at this part! 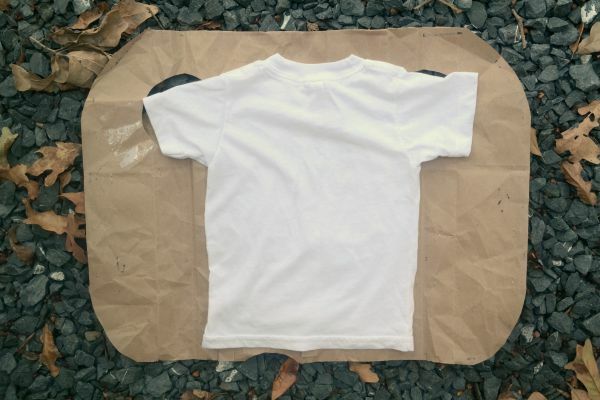 To measure how big to make your vest, use one of your child’s t-shirts as a vague pattern. After the brown bag is cut into a flat rectangle, lay the t-shirt int he middle and fold the ends of the bag over to make the vest the right size. Error on the bigger size, paper bags tear! Then, round the corners of your rectangle with scissors. Once you decide on the size of your vest you need to cut arm holes. Measure 2ish inches from the top of the bag, and cut a 4ish inch diameter circle (depending on the size of the kiddo) where the flap folds over to form the vest. To get the holes exactly symmetrical, fold the vest in half, and use the first circle to trace the 2nd one. 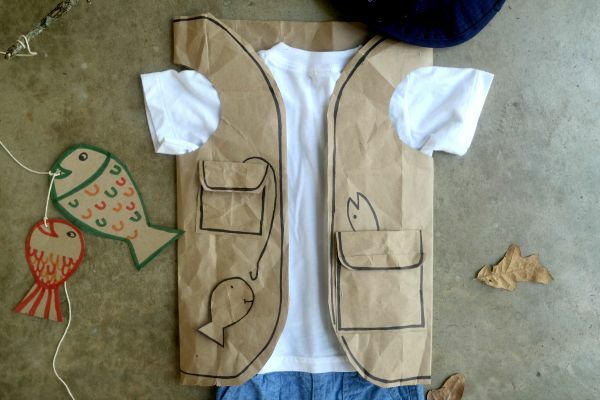 Once the vest is made, it’s time to add the fisherman details! I added pockets by cutting a leftover peice of brown bag into a rectangle and folding it over to make a flap. Then staple the pocket onto the vest! Easy pesay. After you attach 2 pockets outline the pockets with a black sharpie marker, then outline the vest also. You can add fish and hook details with the marker or if you have real fishing lures on hand, use those! Oh and to make the fishing pole, hunt down a fishing pole looking stick in the yard and tie a string to it. Then use an empty cereal box to cut out a few fish and decorate them with markers. Hole punch each fish and tie the string around them, voila! This brown bag vest thing poses endless (free!) dress up opportunities! What to make next?! 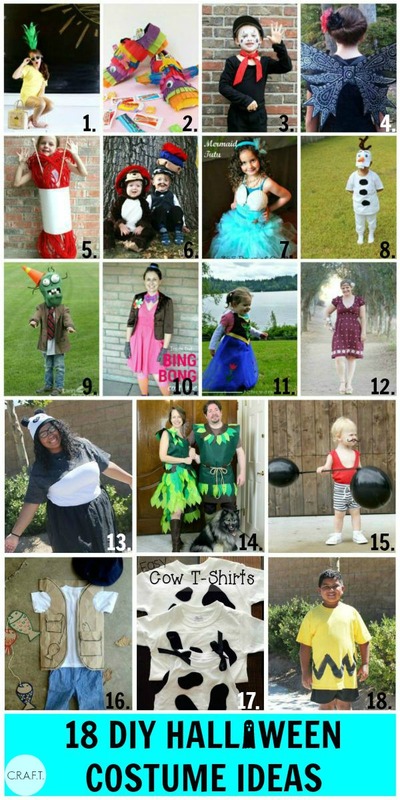 Need more really awesome costume ideas, check out these 18 clever DIY Halloween costumes from my creative friends in blog land! HA! This is awesome! So clever and cute!! I’d love to invite you to my new link party!! It’s still going on with only a few entries. Three of them get featured this Thursday!! Great costume. Pinned! Thanks for sharing with us at #Throwback Thursday link party. Please join us again tomorrow and invite your friends. Adorable! What a cute idea! Pinning to share. Thanks for linking up with us at Snickerdoodle Create Bake & Make! What a fun pretend play idea, too! I love your costume ideas!!! Costumes are not my forte, so I am always impressed with those who come up with clever, adorable costumes! I LOVED your Bob Ross costume you shared at the Family Joy Linkup and shared it on my FB blog page, Don’t Call Me Supermom. Also love that carrot idea you linked to above! Thanks for sharing such cute ideas at our linkup! So cute and creative! What a brilliant recycled project! What a cute and fun idea! My little dude would love it! Thanks so much for sharing at Throwback Thursday! I think we are going to try this today after nap time! Thanks! It’s a fun (and easy) one! Hope you both enjoy it!